Planning your next family holiday? Confused whether to choose a holiday full of cultural heritage or simply a calm and relaxing one? No need to worry anymore, Vanuatu has it all. Whether it is adventure that you seek or the enchanting cultural history, Vanuatu is your spot. An archipelago comprising of 83 islands, Vanuatu is full of natural as well as cultural diversity. Lush green rainforest and rejuvenating coral sanctuaries that offers various activities like hiking, diving and snorkeling, not to mention the active volcanoes being the key point of attraction. Vanuatu in the South Pacific is a warm and pleasant place to visit and with the welcoming nature of the local people you will feel right at home. So before you plan your next Vanuatu family vacation know a few details about Vanuatu that will assist in your travel planning. Air Vanuatu is a domestic airline that offers regular services to all the islands and the airports are situated a 10 minute distance from each island’s city centers. The air fares can tend to be a little on the expensive side so purchasing air passes can save you some money. Among all the airlines in Vanuatu, Air Vanuatu is the most reliable airline with flights rarely being cancelled. Vanuatu has no shortage of resorts, hotels and guesthouses. There are also many motels available for budget travelers with very welcoming hosts. The hotels, resorts and motels etc offer accommodation for families, couples as well as solo travelers. If you want a resort that offers self-contained bungalows you can visit www.islandmagicresortmagic.com and learn more about their resort packages and deals for your next Vanuatu holiday. The currency in Vanuatu is known as Vatu. This is the means of exchange in this island chain. Although some shopping centers and hotels and diners in Vila and Luganville area accept Australian currency all other places only accept Vatu. Almost all major foreign currencies are exchangeable for Vatu. So when you plan your vacation, plan beforehand for currency exchange to get the best rates. There are shared taxis as well as regular taxis available on most of the islands that can get you around the islands. The buses are marked with a ‘B’ on the license plate and the taxis are marked with a ’T’. The buses pass every few minutes and you can also rent cars which is an expensive option but you can negotiate the rates with the local operators. 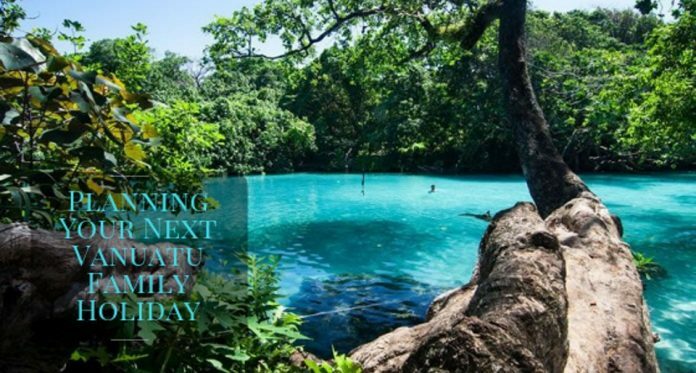 The business hours in Vanuatu are 7:30 am up to 6:00 pm on weekdays with a ‘siesta’ period from 11:30 am to 1:30 pm. Shops and all public operations remain closed during siesta while some of the larger supermarkets remain open till 7:30 pm. On Saturdays shops remain open till 6:00 pm while on Sundays most shops remain closed and there is also a rule that you cannot purchase alcohol from any shop after 12:00 pm on Saturdays and all day on Sundays. Vanuatu has a relatively cooler and drier climate between May and October and it is the best time to visit this island where the daytime temperature stands at around 26 degrees celsius. During the hotter season between November to April the temperature during daytime is 29 degrees celsius. But the country is prone to cyclones at this time of the year. Vanuatu, with its mosaic of cultural heritage and scenic beauty, is sure to put a smile on your face and brighten up your holiday. Hopefully this article has provided you with all the necessary information that you need to know while planning a Vanuatu holiday.